The 2018 ARTYBall revealed that there is a swag of local artistic talent in our community, and the Community Centre is sponsoring an ARTYFestival as a broader opportunity for locals to display and promote their arts and craft. 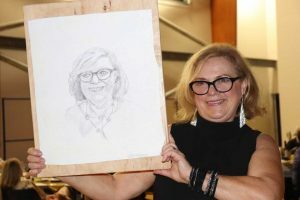 Convenor of the event, local identity Leonie Guerin, said the proposal is to make the community hall a gallery from May 1 – 6, showcasing local art and craft through exhibits, demonstrations, classes and workshops, as a promotion of the talents of Rainbow Beach. So, to all you authors, painters, printers, sculptors, fabric artists and more, the invitation is extended to be a part of this spectacular and show your wares. Get in touch with Leonie on 0407 529 624 or at jayleonie@bigpond.com to register interest or just to discuss ideas. It is intended that the kitchen will be an active part of the gallery, providing refreshment and hopefully cooking demos through the week. And remember, the 2019 ARTYBall is on in October.